Ice cream. What could be more perfect on a sweltering day? When you’re traveling in foreign lands, you might get a reminder of how something that seems universal really means something different to other cultures. 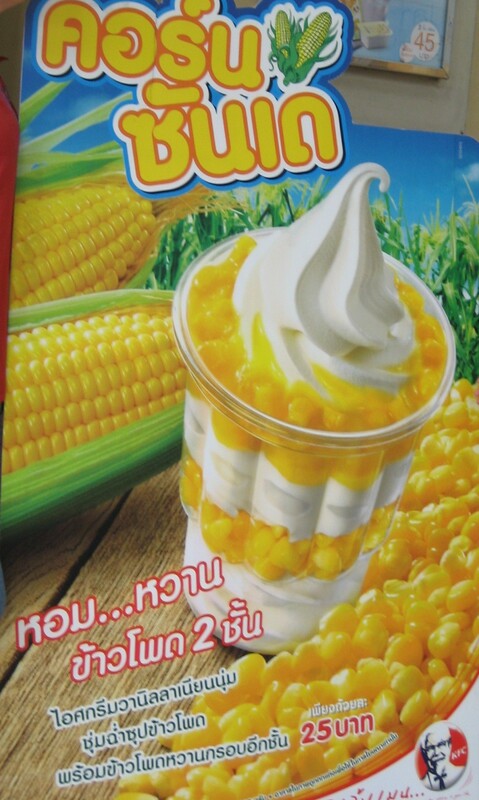 When I visited Thailand, several years ago, I had that realization when I encountered the corn sundae. ‘DipNote’: Before I continue, I’d just like to take a moment to thank all of you readers – whether you are followers or casual friends or fellow bloggers who happened to ‘stop by.’ As of yesterday, The Culinary Diplomat is six months old! It’s been a lot of work, three food adventures per week for six months, and it would mean nothing if not for each of you! Thank you! Corn is more American as apple pie! Yet corn is not something Americans typically eat for dessert, much less with ice cream. 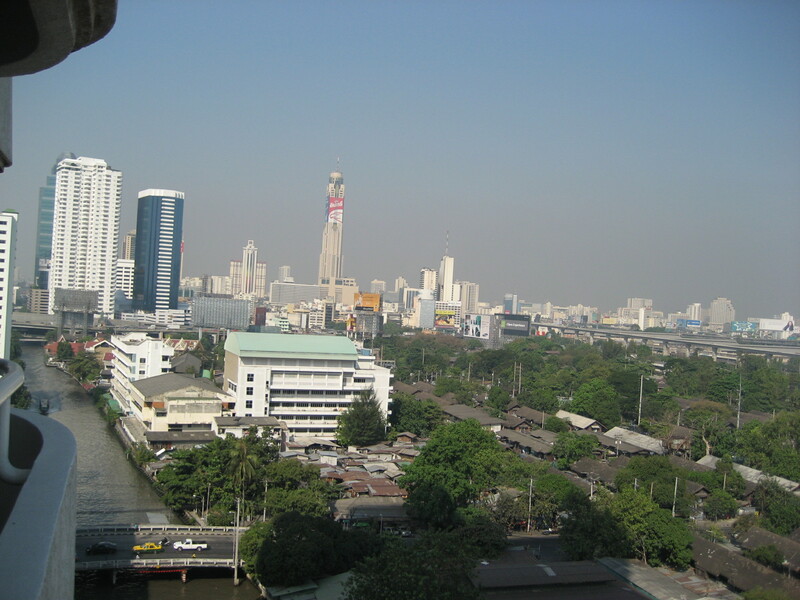 It didn’t take long in the great city of Bangkok to realize that the Thai people (and other southeast Asian people) view corn differently than my own culture. Where we Americans look at fresh corn and see animal feed; July 4th corn on the cob or perhaps spicy, cheesy Mexican elote; and maybe cornbread or corn pudding, Thai restaurants treat it as a sweet delicacy. It was an exotic topping for pizza (also, I’ve seen that in Europe and India) and also a sweet filling even in McDonald’s fast-food pies. So when I walked by a KFC storefront and saw a sandwich board propped outside advertising a corn sundae, I was intrigued. Yes, Americans, it was that KFC; it is huge in Asia, much more popular these days as an export to Asia than in the States. After passing by several more times, I finally decided to convince my friends that we had to try it. Try it we did. The corn sundae consisted of vanilla soft-serve ice cream, followed by a parfait-like layer of creamed corn (the very stuff your grandmother made you eat as a child), then more ice cream, all topped with canned yellow corn. Now, I like corn pudding and sweet cornbread. I thought it would be a bit odd, but doable. One bite … and it was horrendous. I still giggle, years later, when I see the photos of the look on my face while eating it, and then watching my friends go through the same. All three of us couldn’t eat a bite with a straight face. We meant no insult to Thai taste buds, but it wasn’t a flavor combination that was remotely pleasing or familiar. And by trying it in a fast-food sundae, I’d hoped to ease into that flavor profile – something not too foreign, but even that was a bit much. Later in the same trip, we had a similar experience with what looked identical to a giant Rice Krispie treat in a Hong Kong convenience store. It turned out to have no sugar or sweetness whatsoever to it, which was unexpected and thus disappointing! For as many amazing food adventures as I’ve had since that trip, these are examples of ones that were taste failures. Why? Not necessarily because they were terrible, but because we had different expectations, and the reality was beyond underwhelming. Despite that, they were wonderful adventures shared with my best friends. So they were worth every grimace! I’m still avoiding corn sundaes these days, but I’ll take Jeni’s Splendid Ice Creams‘ Sun-Popped Corn in its American kettle corn, candy-sweet glory!